The creation of high-quality, flavourful crunch bars, brittles and similar products depends on careful and consistent cooking. For small batch producers, hand mixing and manual temperature control is labour-intensive, time-consuming and provides inconsistent results. An automatic cooker that provides perfect temperature control and constant mixing allows the production of superior quality products even in small-scale production environments. The C Mod range of automatic cookers from MIA Food Tech allows smaller-scale producers to increase their efficiency and product quality by introducing automatic, precision cooking to their crunchy cereal product manufacture. The C Mod line includes 4 different variants, offering cooking capacity of either 30 or 60 litres, and single spatula or planetary mix options to suit your exact requirements. These MAI Food Tech cookers offer an efficient electrical heating system which maintains the ideal cooking temperature throughout the cycle, avoiding burning syrups. 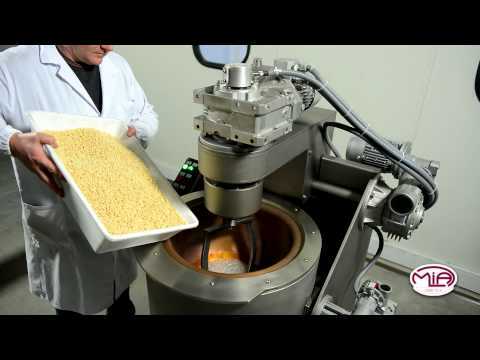 For maximum mix efficiency they use both head and bowl rotation, ensuring a perfect product mix in less time. With all stainless steel construction, the C Mod range of cookers are quick and easy to clean, reducing the downtime associated with cleaning, sanitisation and changeover. The mixing bowl is electrically operated allowing for simple one-person operation when emptying, cleaning or filling. MIA Food Tech ( www.miaft.com) manufactures small and medium scale equipment for dragées, сereal bars, nuts and nougat. MIA Food TECH specialises on small and medium scale equipment for dragées, сereal bars, nuts and nougat.